Hulls with a steep deadrise angle (above), slice through the waves, providing a smoother ride. How does your boat ride in a chop, or in large waves? The answer will largely depend on hull deadrise angle. Hulls with a steep deadrise angle, as in the first picture, slice through waves as they enter the water, and don't pound along on top of the waves. People who want to travel at high speeds in large waves know that boats tend to launch off of one wave and land on the next one with a crash that shakes everyone and everything aboard. It's hard on the equipment, and hard on the people. More wetted surface, because the hull projects down into the water instead of riding on top of it. This means a deeper draft and worse fuel economy. Less lateral stability, because the boat must roll further before it starts to sink the sides of the boat. Poor reserve bouyancy and lift forward. That's a fancy way of saying it will punch right through waves instead of going over them. Wet ride, because the hull tends to fling water upward instead of outward as it slices through waves. If you're going across the wind and your bow is flinging water up in the air, you're going to get a shower. The addition of chines to a deep V hull can provide some of the advantages of a deep V, while reducing some of the disadvantages. Some of these problems are addressed by adding chines to deep V hulls, as in the next picture. Sometimes these look better on land than they actually work on the water, but on many hulls they provide a great compromise, affording some of the benefits of a deep deadrise hull, but tempering the disadvantages. Each chine decreases the overall deadrise angle of the hull. 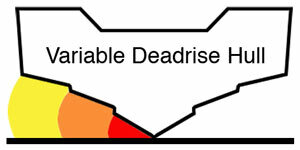 In the picture, a dotted line shows how effective deadrise angle is lower because of the chine. Chines provide some flat surface area in the water, which means more lift compared to an angled surface. The boat will draw less water and will have greater roll stability, and chines can deflect spray which would be thrown up. They can also cause pounding in heavy waves, because if they are large enough to really be effective, they are also large enough to prevent the boat from slicing cleanly into a wave. Some of the older Formula boats made impressive use of chines to give a great ride in rough water, but still possessing reasonable handling characteristics and ordinary draft. Our friends had a Formula 24 express cruiser with twin 165 hp Mercruisers, and we had an Aquasport 240 with a 230 hp OMC sterndrive. I had plenty of opportunity to observe the difference in how the boats rode in various conditions. The shallower hull of the Aquasport made it fast, stable, and efficient, but we would really take a pounding in larger waves, while the Formula seemed to glide in and out of waves without the earth-shattering crash of a boat doing a belly flop. The Aquasport, despite the relatively flat entry, was a wet boat until we added some mahogany spray rails up forward. Those did a great job of deflecting spray, but were far enough forward so as not to affect hull entry. Back in the 80s, I had an 18' Hydra Sports and a friend of mine had a 21', both with a very deep V entry with chines all the way out at the edges. It made for a great ride offshore, but was slow and inefficient compared to similar boats such as Dolphin and Mako boats. The hull chine prevented the boat from rolling too much while trolling in crossing seas, and from digging in too much in tight turns at cruising speed. In a variable deadrise hull, the center section comprises a deep V deadrise angle, then the angle shallows out in upper sections. Another solution to the deadrise angle balancing act challenge is found on older Sea Craft boats, as well as the modern Sea Crafts and some of the Sailfish hulls. This is shown in the third picture, and is called a variable deadrise hull. In a variable deadrise hull, the center section is made with a deep V deadrise angle, then the angle is shallower in the next sections outboard, and shallower still out at the edges. When the boat is on plane, the outside sections with low deadrise do not enter the water as the other sections slice through waves, and there is no flat or curved-over part as you find on a chine to cause slapping or pounding on waves. The design works well, but the particular angles and load distribution are important. In most conditions, the old 18' Sea Craft center console was actually a better riding boat than the 20' Master Angler. I don't know why, but from watching both boats pound along in the Gulf Stream, the 20 footer was breaking through the waves approximately amidships, while the 18 entered the water a little further forward. The difference was dramatic, but it could be cancelled out by improper loading of the boat. On the old 23' Sea Craft with outboards, it was sometimes hard to get enough weight forward to get a good ride, and trim tabs were needed to hold the bow down. The same hull with a single Volvo sterndrive with a jackshaft to the engine mounted underneath the console would tend to ride more level because all the weight of the engine located so far forward would force the boat to enter the water with the deeper V section first, slicing instead of pounding. Bay boats frequently feature a medium deadrise angle hull, giving them some of the choppy water ride characteristics of a deep deadrise hull, but also some of the stability and shallow water capability of a low deadrise angle hull. Bay boats often have a moderate deadrise angle, sometimes with chines. The chines serve the same purpose on these hulls as on deep V hulls, but aren't needed as much because the form of the hull makes it more stable, shallower draft, etc. Action Craft, Sport Craft, Mako, and Aquasport are examples of manufacturers that employ a medium deadrise angle on many smaller to mid-size boats. A moderate deadrise angle hull will not slice through waves as nicely as a deep V hull, but enjoys several advantages. It is more stable, will not roll as much, is fast and fuel-efficient, does not draw much water, will not punch through waves as readily, will not broach or swerve or heel excessively in turns, will turn sharp in docking situations, and is often a pretty dry ride. It's a good general-use compromise. Flats boats often have very shallow deadrise hulls — not pleasant for choppy water, but excellent for motoring into shallow water and getting on plane quickly. Flats boats have flat bottoms or very shallow deadrise angles. This is great for use in shallow water, getting on plane quickly, etc. but will pound the heck out of you in chop. These hulls sometimes have a very steep deadrise angle up very far forward, feathering out into a much shallower deadrise angle pretty quickly as the hull widens out. If the nose of the boat is kept down, such a design can slice through small chop pretty well, but once the waves get to a certain size, you will be hitting them with the entire forward section of the boat all at once, and the relatively flat sections are going to pound. Most flats fishermen make try to stay in shallow or protected waters on the way to and from fishing spots because the boats are wet and uncomfortable in heavy chop. To get the engine up higher, manufacturers sometimes put a "step" in the aft section of the hull, just forward of the engine. This is basically a small bite taken out of the hull, allowing the water to come up off the hull toward the engine at a higher position on the transom than if the V were continued all the way aft to the transom. Such a design, coupled with the use of a hydraulic jack plate and power tilt and trim, can reduce the draft of the engine by as much as a few inches when on plane, and every inch counts to a flats fisherman. You can't tell how a boat will ride just by looking at it. At least I can't. Some have a very aggressive deep V shape forward, but actually break water further aft, and pound like a flats boat in waves. Some don't look like they have such a steep deadrise angle, but have a really nice ride in some very large waves. You can get some idea of how a hull will perform by looking at the deadrise angle, but the only way to really know how a boat will ride in waves is to take it out. I have a ’79 Formula 255 Liberator with twin 400 Horse Small Blocks on Bravo I drives. People often ask why I spent the time and money to restore a 30+ year old boat…until they ride with me outside with seas running 3~5 feet. At 30~35 MPH I am sitting at the helm with a drink crushing the waves while many newer boats around me are pounding their occupants organs into jelly. My guest often times ask me where can i get a new boat that rides this good. My answer is to go write a check in the six figure range and get a new Formula or Cigarette! Nice. I wish I had a boat like that. All I have is a 50hp ZapCat and my drink spills every time I go out. I even replaced the cup holder but it did not help. Sh*t, threat detected. Bailing out.